My father introduced me to painting over 30 years ago. One of his first lessons was to always paint what I love. I took his advise and have combined my love of dogs and painting. I now specialize in portraits of dogs, especially working dogs such as police K-9, search and rescue, etc. I have also branched out into my other love of my life…horses. Recently, I have focused on painting police K-9′s that have been killed in the line of duty. I donate the portrait to the dog’s handler free of charge. I feel that these unsung heroes deserve all the respect we can give them, and this is my way of doing just that. I work in both Oils and Pastels. All of my work is hand painted on stretched canvas. I work from reference photos that you provide. 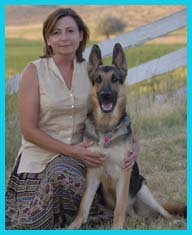 See the link to the Photo “How To” Guide if you need help getting a great shot of your beloved pet. I would love to be commissioned to paint portraits of your dog or horse. Please see my price list and contact information if you are interested in commissioning a portrait. Don’t hesitate to contact me if you have any questions at all. I’d love to talk to you about your special friend. You can see one of my special friends in the image below. Copyright: All rights reserved by the artist, Tracy Klett. The copyright for reproductions of these paintingsremains with the artist. Any digital images of your finished painting are for your own personal use and reprints of your painting are not to be sold for profit. This website is only for your personal use. You may not distribute exchange, modify or sell anything you copy from this Site, including but not limited to any text or images, for any business, commercial or public purpose without permission.